I've seen several readings of new work this year, including The History Theatre's Raw Stages festival and Theater Latte Da's NEXT: New Musicals in the Making. They've all been so creative and interesting and diverse, but I think my favorite is Sweet Land, a new musical based on the lovely little Minnesota-made movie. It's a simple but beautiful story about early 20th Century immigrants making a life on Minnesota farmland, full of humor, heart, and nostalgia for a time gone by. Creators of the musical Perrin Post (book), Laurie Flanigan Hegge (book and lyrics), and Dina Maccabee (music) have done a wonderful job retaining what was so special about the film while adding music that feels organic to the story. It was presented last Sunday by a cast of talented local actor/singer/musicians as it continues in the development process. 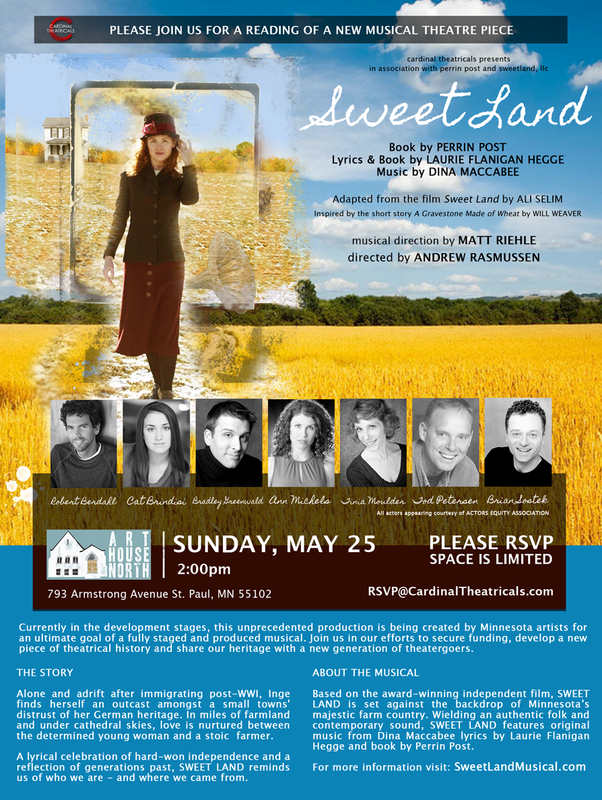 More than any other new work I've seen this year, I hope to see Sweet Land in a full production sometime soon. If you've never seen the 2005 movie Sweet Land, you should go directly to Netflix or Blockbuster or however you get your movies and watch it! Filmed near Montevideo, MN and including cameos by local actors (including the Stephens D'Ambrose, Pelinski, and Yoakam), it's the quintessential Minnesota story of Norwegian and German immigrants forging a life on the farm, with all the difficulties and rewards that entails. In this particular story, Norwegian immigrant Olaf Torvik needs a wife, so his family in Norway send him one. When Inge arrives, Olaf is surprised to find out that she is actually German, which is not well accepted by the community so soon after WWI - Germans are the enemy and she could could be a spy. The pastor refuses to marry the couple, and Inge is forced to stay at the neighbors farm with Frandsen, his wife Brownie, and their many children. It doesn't take long for Inge to get fed up with this crowded living arrangement and long for a space of her own, so she makes her way across the field to Olaf's farm and take up residence there, helping him with the farm. Despite the fact that Olaf sleeps in the barn, this arrangement is frowned upon and the couple is shunned by the community, until their hard work, perseverance, and generosity slowly win everyone over. They are accepted and allowed to live their life together as man and wife and an important part of the community. The creators of the musical have stayed true to the plot of the movie, with many of my favorite moments and lines represented or even turned into song. The good-natured Frandsen calls Inge "ducky" and she doesn't quite understand, which has been turned into a fun light-hearted song. At the end of the movie, after living and working together for so long, Inge declares that she and Olaf are already married without any ceremony or legal documents necessary, which has become a beautifully moving ballad. The moment when Olaf first really looks at Inge through the camera lens, the auction, Olaf's declaration that "farming and banking don't mix," the threshing scenes, Inge's rebellious bath, all of these are songs. They really did take all of the best and most memorable moments in the movie and turn them into songs, which is really the best way to make a musical. The music is all wonderfully Americana, with a couple of guitars, a fiddle, an upright bass, and an accordion in the band (directed by Matt Reihle). The intention for the full production is for the band members to double as ensemble members, playing some of the smaller roles and joining in on the singing. This is similar to the new musical Once, also an adaptation of a sweet and simple but lovely movie, in which the musicians are also the ensemble; perhaps this multiple Tony winner has defined and allowed for a new type of musical. A musical like this one in which there is no differentiation between actor, singer, and musician, with a style of music that strays far from "Broadway" into territories of folk, country, and Americana. With only about twenty hours of rehearsal, this amazing cast, directed by Andrew Rasmussen, has managed to bring this piece and these characters and songs to life in such a way that it's not difficult to imagine a full production. Ann Michels is the perfect Inge, with the spark and strength and humor of the character, while also showing her vulnerable longing side. Robert Berdahl is also wonderful as Olaf, a typical Norwegian farmer hiding his feelings deep down inside but allowing them to come to the surface at pivotal moments. As Frandsen and his wife Brownie, Bradley Greenwald and Tinia Moulder bring heart and humor. Rounding out the ensemble are Tod Peterson as the pastor and Cat Brindisi and Brian Sostek as all other characters. This is truly a top-notch cast and I hope they all continue in future productions of this piece. Sweet Land is such a special little movie, a small story but one that's so moving and timeless and beautiful. It's a piece of our history as Minnesotans, one that I, as a descendant of German immigrant farmers, feel a special connection to. The musical is everything I hoped it would be, retaining what was so special about the movie and its wistful, funny, romantic tone, and only adding to it with the wonderful new original music of the Americana style that I love so well. I am confident we will see this again. Visit the Sweet Land musical website or become a fan of their Facebook page for more information about the piece, future productions, and how you can help with the next phase of development.